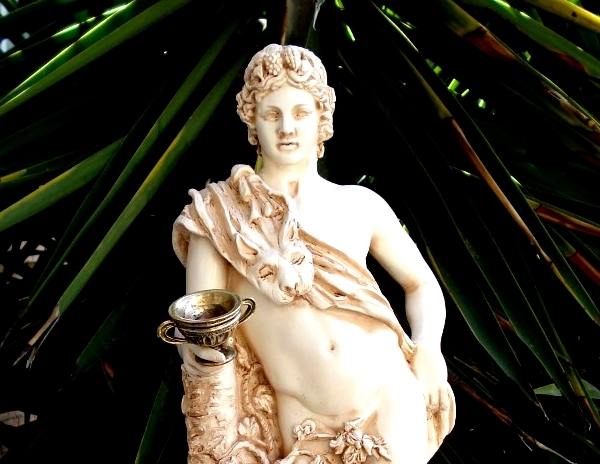 Dionysus, known also as Bacchus was the god of the grape harvest, wine, and mystic ecstasy. Dionysus was the god of Zeus and Semele a beautiful mortal woman. Zeus' wife, Hera, discovered the affair while Semele was pregnant. Hera pretended to be Semele's friend and convinced her to ask from Zeus that he reveal himself in all his glory. Hermes of Praxiteles, 330 B.C. Hermes carrying the infant Dionysus to Nysa. 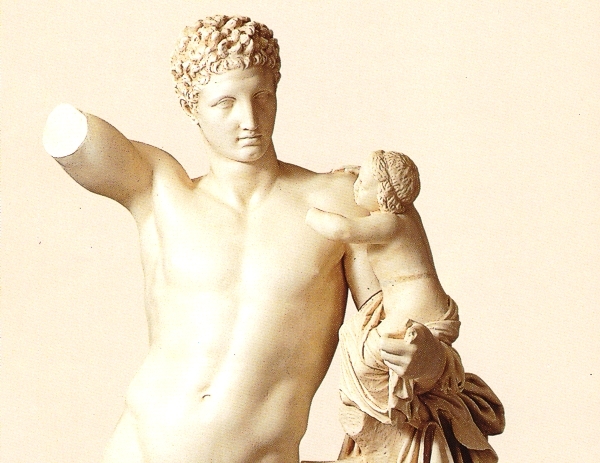 Hermes is believed to have been holding grapes with his right hand with Dionysus reaching out to grab them. Though Zeus begged her not to ask this, she persisted and he agreed. Therefore he came to her wreathed in bolts of lightning; mortals, however, could not look upon an undisguised god without dying, and she perished in the ensuing blaze. Zeus rescued the fetal Dionysus by sewing him into his thigh. A few months later, Dionysus was born on the island of Ikaria, where Zeus went to release the now-fully-grown baby from his thigh. The baby was Dionysus, the "twice-born" god. Zeus sent the baby to be brought up in Nysa, a far-away land (probably Ethiopia in Africa) out of the way of Hera' s jealousy. Hermes was tasked with delivering the baby to the rain-nymphs of Nysa and Papposilenos - who would later become a prominent member of the Satyrs - who nourished his infancy and childhood. featuring the journey of Dionysus to Naxos. Around the vessel the Tyrrhenian pirates swim transformed in dolphins. 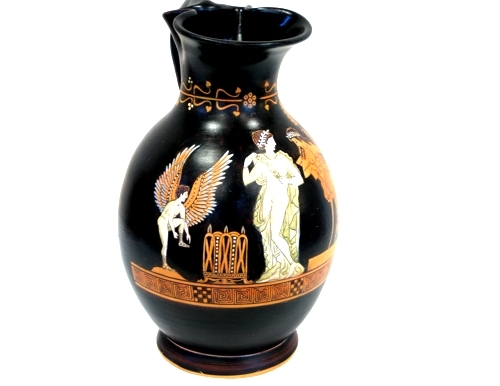 500 BC. Antikensammlung Munich, Germany. 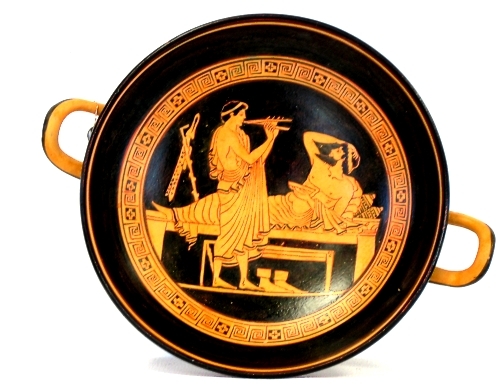 Red figured kylix featuring Dionysus resting under the sound of a flute. 340 B.C. Munich Museum, Germany. 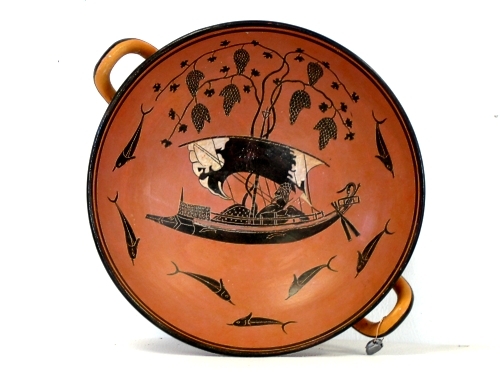 One story recounts how Dionysus desired to sail from Icaria to Naxos. He then hired a Tyrrhenian pirate ship. However, when the god was on board, they sailed not to Naxos but to Asia, intending to sell him as a slave. So Dionysus turned the mast and oars into snakes, and filled the vessel with ivy and the sound of flutes so that the sailors went mad and, leaping into the sea, were turned into dolphins. Dionysus in general appears to be a god who has two distinct origins. On the one hand, Dionysus was the god of wine, agriculture, and fertility of nature, who is also the patron god of the Greek stage. On the other hand, Dionysus also represents the outstanding features of mystery religions, such as those practiced at Eleusis: ecstasy, personal delivery from the daily world through physical or spiritual intoxication, and initiation into secret rites. Scholars have long suspected that the god known as Dionysus is in fact a fusion of a local Greek nature god, and another more potent god imported rather late in Greek pre-history from Phrygia (the central area of modern day Turkey) or Thrace. Dionysus, Aphrodite and winged Eros. Also known as "The vase of love". 350 BC, Metropolitan Museum, New York.